We’ve had that question asked so many times since we finished our Airstream Renovation that I’ve lost count. But here we are. One year in, and I have a much clearer idea of how our choices have worked out so far. And I finally psyched myself up enough to get this all put together. This is part one, we'll call it "the plan" wherein I'll take you through the why's of what we did. Part two will focus on the actual installation. Ready? Deep breath. Ok, let’s get to it. To understand your solar setup you have to first understand your power usage. In our 5th wheel trailer, the battery indicator was useless. I had no idea how many amp hours I had or how many amps anything was using. I killed at least two batteries within a year! So a big part of the process was doing the math and figuring out how much power we used in our previous trailer and then how much we wanted to be using in the Airstream on a daily basis. I wish I could tell you a surefire way to calculate all this up (and there are a few worksheets out there), but our biggest resource was other people already traveling full time and camping off the grid. Their input was invaluable, and gave me a much better idea of how much power real people use, living and working full time on the road. In case you haven’t read up on our other design choices and goals with this Airstream renovation, we were sick of staying in parks and wanted to camp off the grid as much as possible. Boondocking as they call it. So our choices were centered around not being connected to a power plug most of the time. What was cool about this process was that we weren’t designing a solar setup around an existing power installation. We got to design everything from the ground up. We got to choose exactly how we would live in terms of power usage. Our goal was to run native 12v as much as possible since we were going to have a big battery bank and solar. And if we needed to plug up, the rest would be low power enough that we could run the whole rig off a single household plug. That’s right, we don’t really need 30amp! All our appliances run on 12v and/or propane - except for the air conditioner. We also made sure to gauge wires generously so that all other small electronics ran on native 12v, too. This leaves us with only two items for 120v. Our residential outlets and the air conditioner. I know what you’re going to ask. No, we can’t. And we didn’t want to. We don’t have a microwave (we think they do bad things to food) so 1,000 watts works just fine. What’s awesome about this is that we can literally plug the whole trailer up to a 20amp plug and run the AC and outlets. This makes staying in our friends’ driveways a breeze. It also means we only need one 2000 watt Honda EU Generator to charge the batteries and run the plugs. And if we got an easy start capacitor for the AC we could run it off that single generator, too. One day we may splurge on that! We settled on a 400 amp hour lithium battery setup. Based on other friend’s real world usage it felt like a good “middle of the road” size for living and working full time in the Airstream. It’s plenty big enough to go for days without a charge, but not so big that it would take 2 years of boondocking to pay off. We’ll get into more details about the battery in a bit. This is just a high level for planning. After lots of research, comparing and measuring we settled on cramming five 100 watt Renogy Eclipse Monocrystalline panels on the roof. And I do mean cramming. It was quite the operation to get them all to fit! But that give us 500 watts or about 30-35 amps of peak power coming in to charge the batteries. While 500 watts have been great in the summer, we’re finding that we have to be more mindful of what direction we park and make sure we tilt the panels at 45 degrees during the winter months. When renovating the Airstream we knew that the winter months could be difficult so we installed an exterior plug for a solar ground deploy. At some point we may add another 200-400 watts in something more portable that folds up and stows away in the truck. For now tilting is working great so it’s just a matter of convenience vs. hassle. Series - Usually used for smaller systems with a MPPT solar charge controller. When you connect your panels together the voltage increases, but amperage remains the same. Then the MPPT controller translates that into the power to charge your batteries. Because the amperage stays low, you can use smaller gauge wire, BUT series has one big downside. If one panel is shaded, the maximum output for each panel is dropped to the same as the low producing panel. Parallel - Often used in 12v systems, connecting your panels this way increases the amperage and keeps the voltage the same. This requires a heavier gauge wire, but doesn’t have the shading problem that series does. Series-Parallel is also an option if you’re running into maxing out your controller. This just means you group some panels together via series and then parallel into your controller. We chose to go Parallel, but with an MPPT controller. So we have a positive and negative 10 AWG wire run from each panel down into a distribution block. It takes those 10 wires and converts to two heavy gauge wires that run straight into the solar charge controller. And all is right with the world! For a more detailed explanation, check out Renogy's series and parallel article. Look, this is already a long post so I’m not going to dive too deep on the differences between Lithium and Lead Acid batteries. Just the top reasons for why we chose lithium. Lead Acid batteries are cheap and dumb (in a good way). You can use a simple controller to pump power into them, connect them with wires to make a big bank, and it's super easy to find a replacement if one goes bad. The downsides? They are big, heavy and not very efficient. They say if you buy 200amp hours worth of Lead Acid batteries you only end up with about 100 that are usable. Their output drops as they loose a charge. Oh, and make sure you don’t let them fall below 75% or their life is drastically reduced. If you just use your camper for short trips then lead acid batteries make a lot of sense. The batteries are going to get charged up back home and the extra weight/space isn’t a huge deal. Plus they are cheap! But if you’re living and working full time in your trailer, Lithium makes a lot more sense. These work a lot like the battery in your phone or laptop. They are much smaller and lighter, sustain their power even as their charge drops, and can deplete to nearly empty without causing damage. They also don't release noxious gasses and can be stored inside without having to worry about venting (other than for temperature reasons). Yeah Lithiums are super expensive and require a “brain” to protect them from temperature extremes and under/over voltage situations. They charge and top out at slightly different voltages than lead acids so finding the right charge controller and converter can be tricky. Basically it’s going to cost more and be more complicated to setup. But once it’s setup it should be fairly worry free unlike lead acids where you’re constantly thinking about not letting their charge drop too low and damaging them. For us, the amount of money we would be saving camping off the grid (and not paying to stay at a park) made sense for our investment. Also, because the Airstream is our primary residence, we were able to deduct the cost on our taxes and get a hefty percentage back. Disclaimer: I’m not your tax guy, talk to him and see if it works in your state. We went with four 100 amp hour batteries from Elite Power Solutions. Sadly, they don’t ship directly anymore so you’ll have to find one of their authorized dealers to pick one up. So far they’ve worked perfectly! Nope, it’s not about your bowel movements! Lithium batteries need a “brain” remember? That’s called a Battery Management System. This little box keeps tabs on each cell, monitoring voltage and temperature. If a cell isn’t charging as fast as the others it’ll shut the other ones off so the slow one can catch up. Too hot or too cold? It’ll turn everything off to protect them. Think of this guy as your insurance policy for all the money you just dropped on those beautiful lithiums. He’s going to keep them healthy and running smoothly. Our BMS also came from Elite Power Solutions - generally you probably want to get your BMS from the same company that makes the batteries. They even re-programmed it for us as we needed to run our bank as 12v. Our BMS has a bunch of connections that let you wire up relays that will turn off if the voltages get too high or low or the temps do the same. It also has a video feed out that you can connect to a monitor to get a handy visual display of your batteries. In order to wrangle all that power coming in from your solar panels into safe, usable energy that charges your batteries you’ll need a solar charge controller. These little boxes come in all ranges of very dumb to very smart and we opted for an MPPT (maximum power point tracking) controller. And it’s pretty smart! Maximum Power Point Tracking uses it’s computer brain to calculate how to wring the most out of your setup. It’s pretty interesting, but not worth digging too deep into here. Basically it works. We got a Blue Sky Energy SB3024DiL which matches up with our solar panel capacity nicely. It maxes out at 40 amps at 12 volts and connects with the IPNPRO Pro Remote Display that let us program a bunch of extra settings to make sure it charged our lithiums properly. Plus knowing exactly how many amps are coming in is never a bad thing! It takes 30/50 amp or 120v power from being plugged in and converts it down to 12v for all your 12v appliances. It uses that converted power to charge your batteries. Believe it or not, we had more converter woes than any other part of this process. 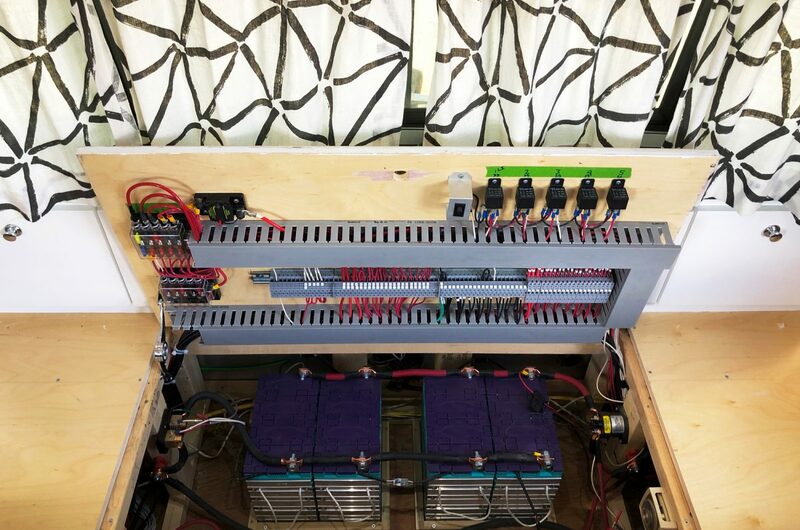 I attribute it to the the fact that we pieced all this together ourselves and that Elite Power Solutions didn’t have a great offering (maxed out at 15 amps which meant it would have taken way too long to charge our big battery bank). Also their batteries run at 14.2 volts instead of the more industry standard 14.6 so we had issues with converters over charging the batteries and eventually had to have our Progressive Dynamics Unit re-programmed with a lower voltage. At any rate, it works great now and with the 60 amps it puts out we can plug up our trusty 2000w Honda Generator and have that bank back full again in about 6-8 hours. So the inverter lets us run our household plugs off of our 12v lithium battery bank and solar. Like I mentioned above, we specifically built our power system with low wattage needs so a 1000 watt inverter has mostly worked for us. If I had to do it again, I probably would have jumped up to 2000 watts for the occasional high power need. "That's great!" you say, "but how did you put all this stuff together?" C'mon now. I just finished this one! Give a guy a minute to catch his breath! Do not fear - the next article in this series will dive into just that - how we installed our system. Until then, ask me anything in the comments below.